Tyson Fury takes his first fight in five months in April when he fights Prize Fighter winner Martin Rogan. He's not an example of technical brilliance, but Fury is always entertaining (and Fury fancies himself as a standup comedian) and this fight should be no exception. The poster is pretty standard stuff, Martin Rogan staring deep into Fury's eyes, whereas Tyson looks at the camera. Maybe that's a sign of disrespect. Below that you can see the Chris Eubank Jr continues his professional career. So far he's gone 2-0 and looked good, but it's still way too early to decide on him one way or the other. 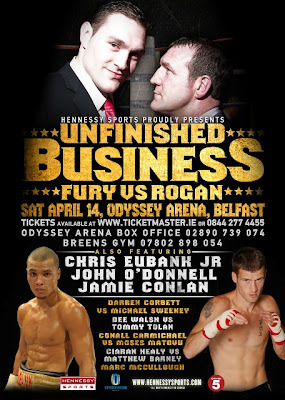 Tickets for the UNFINISHED BUSINESS event at the Odyssey Arena on April 14th are priced at£155, £105, £65, £44, £33 and £27.50 and can be purchased from the Odyssey Arena Box Officeon 028 9073 9074, or via Ticketmaster on 0844 277 4455 (24 hour). 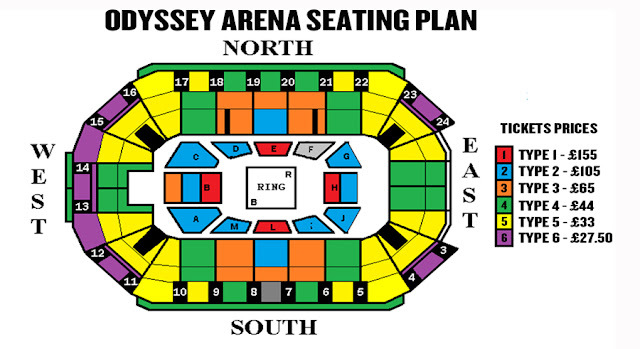 Tickets can also be purchased in person from the Odyssey Arena Box Office and the usual Ticketmaster outlets.